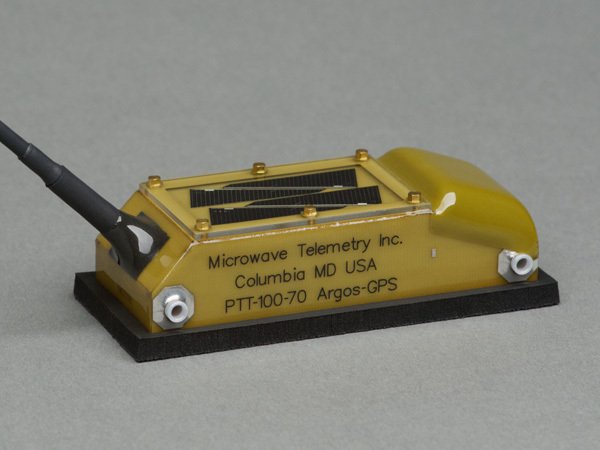 In 2001, we achieved the difficult task of effectively combining a low-power Argos transmitter with a small GPS receiver to create the Solar Argos/GPS 70g PTT. We included a polycarbonate array window, harnessing tubes, and a reinforced antenna base for greater durability, and have continued to update the 70g PTT with our latest technology, including an improved GPS receiver, more powerful battery, and dual solar arrays for swift battery charging. We have also developed additional battery options for the 70g to serve two purposes: the "auxiliary battery assist" option allows the PTT to continue collecting and transmitting data when light levels are too low for it to recharge adequately (e.g., in the winter months at high latitudes), and the "GT backup battery" option extends the life of our GT™ feature to allow researchers more time to locate a downed PTT.